Not only does old, tired, and faded leather ruin overall the look of your car, it negatively affects it's re-sale value too; while well maintained leather upholstery is a significant plus. Cleaning, and reviving the colour of black leather upholstery can do a lot to improve the overall look of your car's interior, and Renovo's Leather Reviver is perfect for the job. 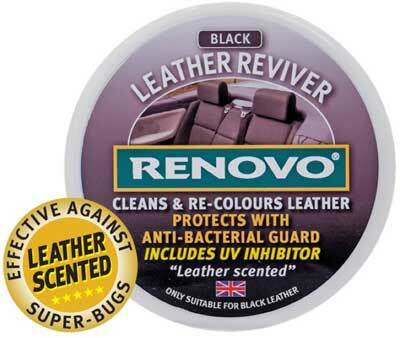 Renovo's new, unique and marvellous formulation not only cleans and re-colours black leather seats, it also protects with advanced anti-bacterial guard, is effective against super-bugs, and contains a UV inhibitor too. Renovo Leather Reviver is simple to apply, gives unbelievable results, and infuses your car with that new leather scent!